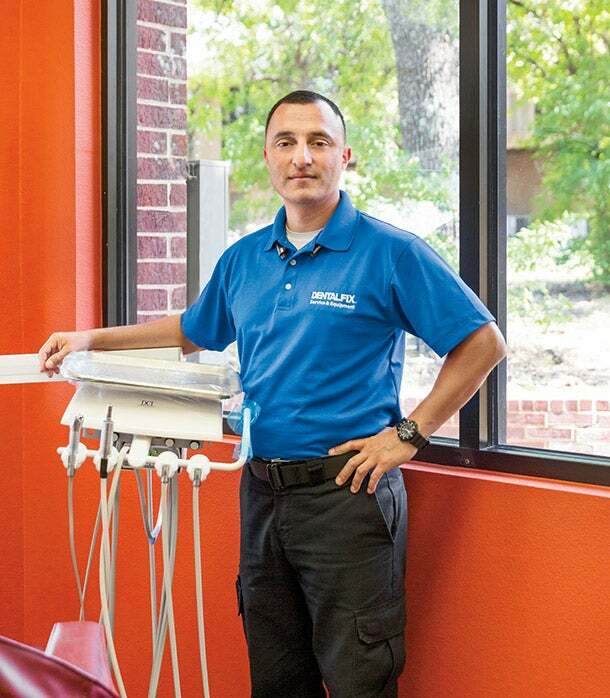 Humberto Gomez, a Marine Reservist, found a new challenge. Humberto Gomez had a good thing going. For 11 years he ran a Farmers Insurance Agency so successfully that he was able to buy a piece of land and build his own office, complete with a private shower he used after daytime runs. Still, he grew restless. As a Marine Reservist who once worked for the Arlington, Tex., police department, he’s always on the lookout for new challenges. He found one after insuring several franchisees of Dental Fix Rx, a mobile company that fixes equipment on-site in dentists’ offices. “Out of all the people I insured, every time I talked to those guys, they sounded positive and excited,” says Gomez. “They were always adding another vehicle or more employees.” So late last year, he handed the reins of his insurance company to his wife and bought a Dental Fix Rx unit. He rolled out onto the streets of Arlington in January, bringing in $10,000 in revenue his first month alone. By the summer, he’d already hired a second technician. You basically went from a white-collar job to a blue-collar job. Do people think you’re nuts? A lot of people did think I was crazy. They said, “You’re a CEO of an agency, and you’re taking off the suit to get dirty and greasy?” I grew up working in the fields, and I’m used to hard work. I was getting tired of sitting in a chair all day. I’m very active and have to do things with my hands. It makes me feel good about myself. This was a perfect fit. My goal is to build this business up and get off the van and become a manager. Anything a dentist touches, we fix that. The heart of a dentist’s office has three components -- a compressor; the vacuum pump, which runs the tools with compressed air; and the sterilizer. If any of those is broken, the office has to close. We can fix about 80 to 85 percent of problems on-site. Some things I need to take back to my office, and [others] need to be replaced. Are there enough dentists to support a repair business? For sure. There are a lot of successful franchisees with 80 to 100 customers. In my territory, we have 420 dentists. I want to concentrate on capturing about 100 of those before I grow. What have you learned from the military that influenced you the most? Presentation is important. When I hire staff, I put on a class about how to dress. I’ve had dentists and their staff say they like how professional and squared away we look. The Marines also gave me the discipline and mental strength to deal with all the stuff business ownership throws at you. So you must carry a lot of extra shirts. Ha! I was just telling my new partner that I recommend keeping an extra set of shirt and pants in the van. Sometimes we do get a little dirty.